While doing research in the Watkinson Library on the Seven Year’s War, I stumbled upon an amazing map that helped me put the world of the past into perspective. My purpose was to discover details that are missing from modern maps. The physical, or scientific, accuracy of the map was not as important to me as how the people of the time saw their place in the larger scheme of things. 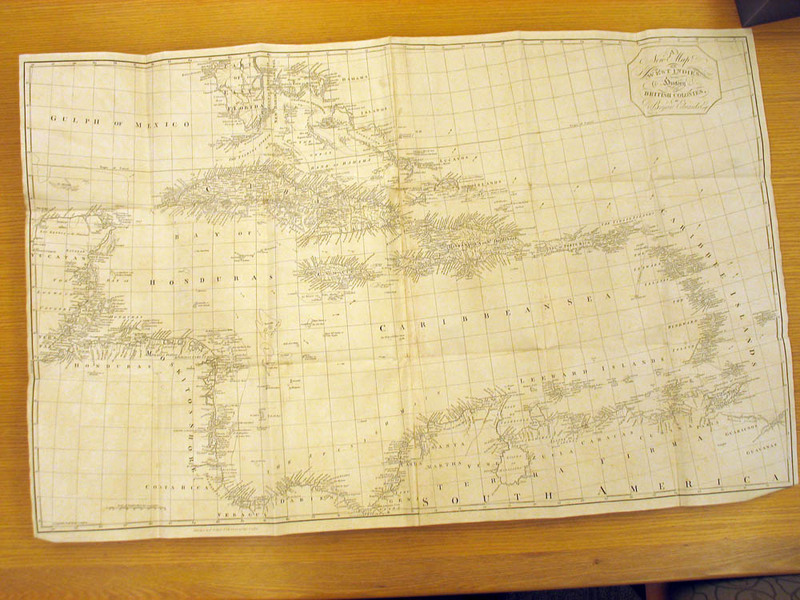 I found what I was looking for–a large fold-out map attached inside the back cover of volume five of the History of the West Indies, by Bryan Edwards. The Historywas originally published in two volumes in 1793. In 1801, the work was expanded to five volumes and was “illustrated by maps and plates.” The Watkinson has the later edition! This was a godsend for me. With the help of one of the librarians, I managed to open and unfold the map. It was huge and covered half of the table I was working at. 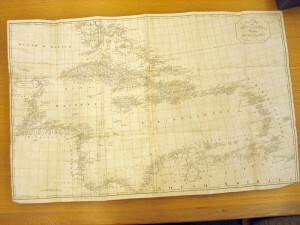 The impressive physical size of the map helped to place the eighteenth century world of the West Indies into context. The islands of the West Indies were isolated–from each other and the rest of the world–by vast expanses of water. The western Atlantic Ocean is to the north and the Caribbean Sea is to the south (one the map these areas are huge). Today, the existence of “space” seems so obvious that it cannot possibly be important. But, in times past, it was. In our “globalized” world of fast and constant communications, we easily forget what a challenge travel was for people. Maps did not diminish the space between places; they made it easier for people to understand and prepare for the expense of time and endurance that long-distance travel demanded. The map is as accurate as you would want a map to be. 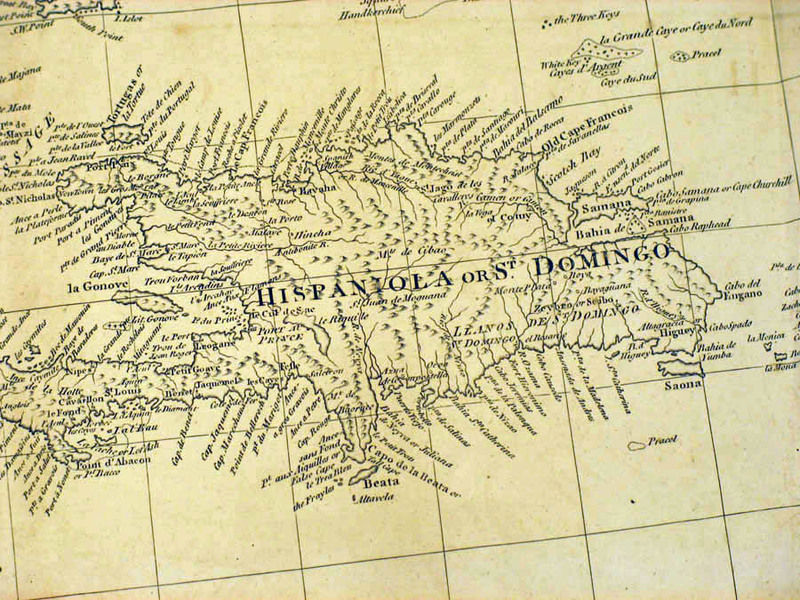 Stretching out in a long arc–from southern Florida to the northeastern coast of South America–the West Indies connect to each other, and the rest of the world, by one thing only: knowledge of their coastlines. The map depicts, in minute detail, all of the shoals and reefs surrounding the islands. Each coastline is annotated with the names of landmarks, havens, capes, and other points of reference. The names are printed so close together that they are almost impossible to read! Eighteenth century travel by sea was all about knowledge of coastlines, shores, and harbors. This map clearly shows this. Standing at the table, and looking down at the map, the islands seem like single-cell organisms, with the crowded writing along the coastlines resembling mats of ganglion reaching out to close the distance between each organism. Without knowledge of coastlines, travel by sea was impossible; a fact the map vigorously demonstrates. The engraved pictures that accompany the History come as a jolt to the modern viewer. 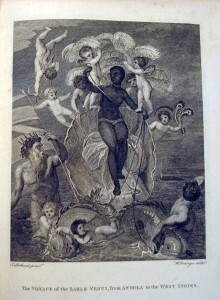 One print, “The voyage of the Sable Venus, from Angola to the West Indies,” is a fanciful wish-fulfillment dressed up as a neo-classical interpretation of a contemporary poem. Pardon my poor attempt at classification [see an online discussion here: http://www.jungnewyork.com/venus.shtml]. 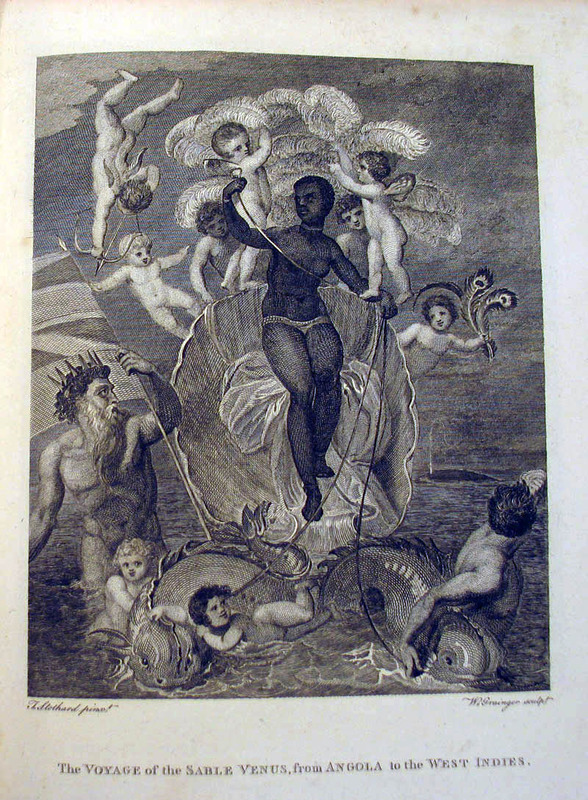 These prints were included in the History to embellish the status of the island’s proprietors. In so doing, the prints project to the outer world a false and biased view of what life was like on the British Islands. The island’s proprietors were able to publish a view of the islands that they wanted the outside world to see. The map, however, tells a different story. Ocean-going travel at the time was time consuming, expensive, and dangerous. 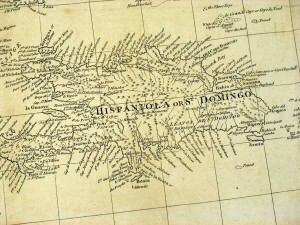 In 1801, there were few people outside the British West Indies in a position to contradict the view of the islands that the proprietors chose to publish. As an independent researcher, writer and historian not affiliated with Trinity, I really appreciate the opportunity of using the Watkinson. My special area of interest is early 19th century education, and particularly the culture of the one-room schoolhouse. Exploring the collection of education materials originally developed by Henry Barnard has been a wonderful experience for me and tremendously helpful. Barnard (1811-1900), was a Hartford native, a prolific writer and an internationally recognized advocate for improvement of the public schools. 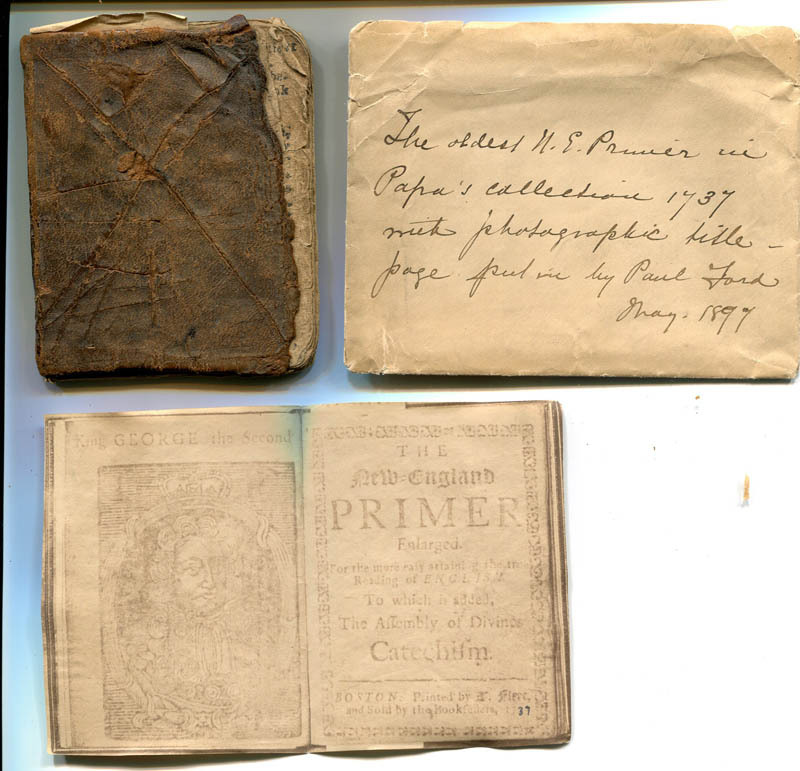 He recognized the importance of looking to the past as a way of documenting our progress, and in this spirit developed an outstanding collection of early American schoolbooks, a collection now housed in the Watkinson Library. 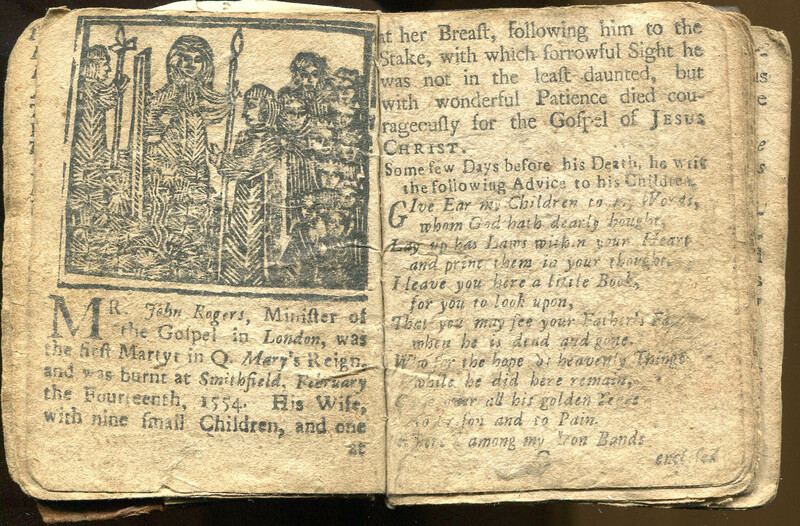 One special treasure that I’ve found is a 1737 edition of The New England Primer. The book is tiny; barely the size of my hand. It’s battered and missing several pages, but its significance is immense. This is one of the earliest known copies of what is arguably one of the most important books in American history. The New England Primer, in countless editions, dominated American education throughout the 18th century, and its influence remained strong until well after the Civil War. Several other 18th and early 19th century editions are included in the Library’s holdings. 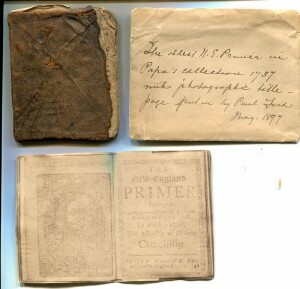 Looking at these The New England Primers today, we can appreciate, just as Henry Barnard intended, how far education has come since those early days. The note was undoubtedly written by one of Henry Barnard’s five children, and “Paul Ford” must have been Paul Leicester Ford (1865-1902), an historian and novelist (and a fascinating figure in his own right), who published many works on early America, including The New-England primer; a history of its origin and development; with a reprint of the unique copy of the earliest known edition and many facsimile illustrations and reproductions (1897). 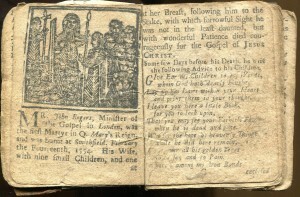 The earliest known copy, dated 1727 and in very poor condition (these were literally read to death), is at the New York Public Library. You are currently browsing the I Found It at the Watkinson! blog archives for November, 2010.